Size: 2.1" x 3.0" x 0.28"
The PS-9000 Back-up Memory Module was designed for the PS-9450 and PS-9500 TimeRunner Organizers. It backs up the entire TimeRunner memory for storage and safekeeping. Within one year the PS-9020 Link Software was introduced to save the memory to a file on a IBM AT-compatible PC. The PS-9000 Back-up Memory Module was sold in Europe as IS-8050 but works with the IS-8200 and IS-8400 Digital Planner, too. 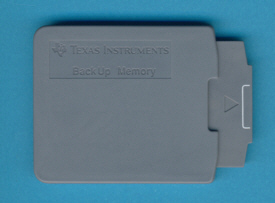 The PS-9000 Back-up Memory Module is featured in the Texas Instruments Incorporated sales catalog CL-1233 dated 1994. © Joerg Woerner, October 23, 2009. No reprints without written permission.